Homeowners in the Baltimore and Washington, D.C. metro area, and throughout Maryland and Virginia rely on Carroll Architectural Shade for stylish, expertly installed residential awnings. 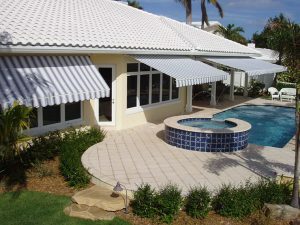 View a photo gallery of our residential awning installations. Five-year ltd. warranty on all fabrics for mildew, rot or fabric failure due to dimensional stability or color loss. See specific warranty for particular fabric coverage. Retractables have up to a 15-year warranty on all framing. A three-year warranty on all motors (Somfy).